Dr. Ajayan Payadakkath is a Specialist Paediatrician at Aster Clinic, Al Butina, Sharjah. Dr. Ajay completed his MBBS (2006) from the Calicut Medical College in India and went on to pursue his MD Paediatrics (2013) from JIPMER, Pondicherry, India. Dr. Ajay brings with him over 10 years of experience and prior to joining Aster DM Healthcare, he was an Assistant Professor in PKOIMS in Palakkad, India. Dr. Ajayan Payadakkath is a Specialist Paediatrician at Aster Clinic, Al Butina, Sharjah. Dr. Ajay completed his MBBS (2006) from the Calicut Medical College in India and went on to pursue his MD Paediatrics (2013) from JIPMER, Pondicherry, India. 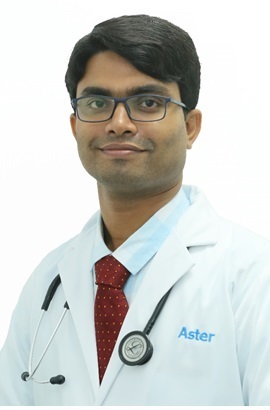 Dr. Ajay brings with him over 10 years of experience and prior to joining Aster DM Healthcare, he was an Assistant Professor in PKOIMS in Palakkad, India. His areas of specialization include Immunization, Paediatric Nephrology and Paediatric Critical Care.